Indian Ecstasies: Chickankari - Threading The Past with Present. Vibrant yet sutle, contemporary yet traditional, Chikankari has a unique style that every Indian love. Chikan work is not new to India and perhaps it never was. Dating back to 18 th century, this Indian embroidery is here to stay for many more decades to come. Fascinated by its exquisite designs, Chickankari has conquered the minds of many fashion designers across the world and is a rage amongst the foreign consumers thus presenting Indian embroidery on a global platform. From time and ages, people like Christion Dior to Fendi have appreciated the craftsmanship and knowledge of the thread work in India. And in this list of enticing thread work, Chickan Kari is counted amongst the top five players. 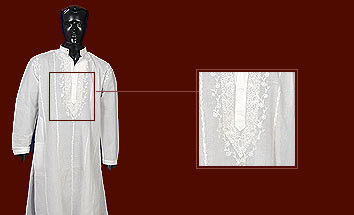 Do you remember the last time you worn a Chickan Kurta, No!!! how would you? since you have no idea that the piece you own is actually a part of history. Stunned!! It was Noor Jahan who turned Chikankari into a high fashion statement. Those were the days, when it was considered De Rigeuer for the ladies of the court to dress in Chikankari. As the history unfurls, we came to know that the endearing embroidery came into shape in 18th century during the era when Nawab of Awadh ruled the state. It was that time when a spectrum of stitches and motifs were evolved and that outrageously covered safas, chogas and Angrakhas of the noble men and women. The stitches used then were simple. As the craft matured, more stitches came into market creating a demand for the thread work. Today, we have Tepchi , Bakhiya, Hool , Zanzeera, Rahet , Banarasi , Phanda and Murri ,Turpai and Darzdari . Be it of any style or stitch, donning a simple chickan piece might just enhance your persona hundred times. Though best in summers, Chikan work can be worn any time and with its versatility ...anywhere.